Driving trucks since i was 15. *farm use* 30 years of driving right there and you know what i still haven't learned everything, don't know it all but i sure know a lot. 20 years of it OTR and O/O had enough of all the BS FMCSA keeps changing on us and damn little of it is for the best. Frustrated with all these people who get rushed through drivers training. Most of all Big Companies like Swift that pump them out so quick the poor driver really has no idea what they just got them self into. The fact they are a Number not a name not a person. You are product that they will abuse for 2 years if you got trained by them so dont' expect to see home to often and get paid crap wages. Information on failed dot drug test for driving school. Use to be able to check your D.A.C report online with hireright.com but i can't find the link But here is this a blurp i found " The report is only available in hard-copy format. Direct any questions to HireRight's Customer Service Department at 1-800-381-0645. But your question is a tuff one. and the grey area is there. You Applied for Truck Driving school not a job. 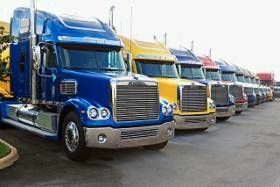 The job could only be offered once you obtained your CDL. *but if it is one of the big companies that you can get training from they might have cause well that is how the roll. * So check your DAC report. Check it Yearly too even if you are a Owner Operator or have worked for the same company for 5 -10 years You never know what can pop up in one. Most companies will ask if you failed a drug test in like 3 years. or so many years. If you have been clean for a few years best i say is if in doubt put yes and explain that you have gotten help and are now clean. Worse they will do is test you more often or not hire you at all. I failed dot drug test for driving school about six years ago and I have been clean for awhile now will failed dot drug test still show up on me I already had permit before they fired me and should I put it on my applications that I have failed a drug test looking to get cdl training by company sponsored. Question is how many can just take our 30 while fueling.. If you don't have some jackwagon for a dispatch that has never driven a truck in their life telling you how to drive you never use up your 14hr day I drove long haul for 20 years before i retired from it. i do miss being able to split the berth and this 34 hr restart now is a joke. at least when i was leaving. Where you could use it once in a 7 day period. Then wtf is the sense of having it. I drove way less tired the old way. i rarely drove my full 11 hours cause anymore you drive 10 and you start looking for a place to sleep. oh and don't get me started with the OBR's Truck driving stop being fun 12 years ago. Reason why i am happy to drive for a small company and local. I don't have to deal with all that bs anymore. Most of the clock challenges I deal with are a result of the "14" not meshing well with the type of work involved with Walmart dedicated. Live unloads that must be observed by the driver (at a minimum) burn up to 5 hours per day with a 5-6 stop run or even more if a second load is dispatched during the work day.